An estimated 562,230 acres (227,526ha) of land in Scotland is in community ownership, according to a new report. The Scottish government has set a target of one million acres being owned by communities by the end of 2020. So far, 492 parcels of land are managed by 403 community groups across Scotland, according to the report by Scotland's Chief Statistician. The largest areas in community ownership are in the Highlands and the Western Isles. The estimated 562,230 acres represents 2.9% of the total land area of Scotland. A number of small islands make up some of the land involved. 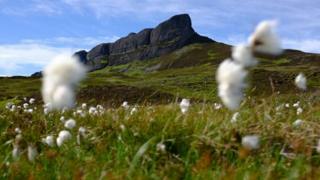 In June, residents of the Isle of Eigg marked 20 years since a community buyout of the island. In 1997, islanders completed their purchase of the isle after years of issues with absentee landlords. Other areas of land in community ownership include the site of a Cold War surveillance station on the Isle of Lewis. The radio and radar station set up at Aird Uig, Gallan Head, 60 years ago was part of Nato's early warning system against Soviet submarines and aircraft. Gallan Head Community Trust bought the site from the Ministry of Defence with help of grant funding.